If anything is constant in life, it’s change. Over time, your smile will change because of a number of factors, some of which are beyond your control. This means that even those with excellent oral health hygiene habits might run into problems that require restorative dentistry attention. Drs. Moss and Owen in Camden, South Carolina offer families in the area a wide range of restorative services, including fillings, crowns, root canals, and eve tooth replacement options such as dentures and partials and dental implants. It happens to pretty much everyone eventually. You brush and floss every day, but you miss a spot and a cavity pops up. Or you’re chewing your lunch when your tooth hits something hard, breaking the tooth. 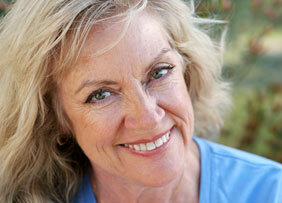 We repair these types of problems with either fillings or crowns. Fillings get their name from the fact that they fill in the hole that forms due to decay, which is called a cavity. Our fillings are made from a composite, tooth-colored material, making them a more cosmetic option – and protecting your overall health. Formerly, fillings were made from a silver amalgam that contained mercury. Our fillings are mercury free. Dental crowns, meanwhile, cover and protect extensively damaged teeth, such as teeth that have broken or been so damaged from decay that a filling is no longer an option. While crowns can be made from many different types of materials, porcelain crowns are very popular because of their natural appearance. Drs. Moss and Owen can perform root canal therapy in their Camden, South Carolina dental office, counteracting tooth pain caused by infected tooth roots and making teeth healthy once again. A nerve runs through your tooth root. Sometimes, for various reasons, this nerve can become infected and inflamed, causing pain and threatening eventual tooth loss. Root canal therapy can help us save your teeth by removing the damaged nerve and cleansing the canal that runs through your tooth root. We then place a crown on the tooth to provide extra protection going forward.